This is a replacement bracket for the standard manual awning with two expansion bolts - not for half cassette awnings, electric awnings or full cassette awnings. If your awning doesn't have the adjuster, (image shown below) you have an earlier model 2007 standard manual awning and this bracket is suitable for your awning. You can also double-check by measuring the width of the torsion bar, needs to be 35mm. 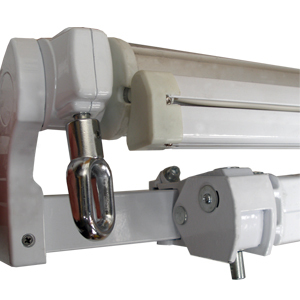 If however your awning does contain the adjuster, then please click here for the 40mm brackets. "Well made product and Yes it fit , so many time you order hoping it's the right one." "ben rappresentato nel depliants e rispondente alla realtà"
"BUT... the instructions are inadequate. The writing is tiny and hard to read, while the layout is confusing. There is no mention of the height ABOVE the fixing that is required. It would be helpful to say that you need a 14mm and 17mm spanner. Numbered step by step instructions would be so much better, and need only take up an A4 page." "The bracket is good but too expensive. There's not much point wrapping it in bubble wrap when it is stuck to the masonry bolts without any protection. The paintwork was damaged by this contact with the bolts." "fitted straight away and are just as the originals, price a little expensive but worth it"
"very pleased with the awning - looks terrific"